A night after the Biloxi Shuckers (5-5) used a two-run homer in the eighth inning to top the Montgomery Biscuits (5-4), the Biscuits returned the favor and hit a go-ahead, two-run homer to top the Shuckers 5-3 on Sunday afternoon at Riverwalk Stadium. Biloxi jumped out to an early lead in the second. Bruce Caldwell walked with one out and Michael O'Neill followed with a single up the middle. After a strikeout by Max McDowell, Trent Grisham dumped a double into left, plating both runners to give the Shuckers a 2-0 advantage. Cooper Hummel added another run in the third, doubling in C.J. Hinojosa from second to make it 3-0 Biloxi. Montgomery used the longball to get on the board in the third thanks to a two-run homer by Josh Lowe, his second of the season. RHP Alec Bettinger limited the Biscuits baserunners until the sixth inning, striking out eight in his 5.1 innings of work. The Shuckers put the leadoff runner on base in the fourth, fifth and seventh innings but were unable to put a run across. Montgomery tied the contest in the bottom of the sixth on a single to left by Jesus Sanchez and a fielding error, allowing Dalton Kelly to score from second. 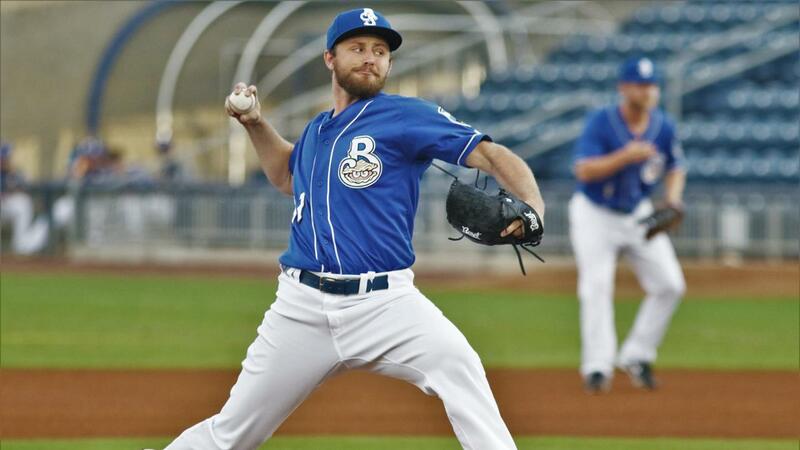 In the top of the eighth, the Shuckers had an opportunity to go in front against RHP Phoenix Sanders (W, 1-0) as McDowell and Grisham drew back-to-back walks to start the frame. Weston Wilson hit into a 5-3 double play, but the Shuckers loaded the bases on a walk to Hinojosa and an intentional walk to Dillon Thomas. Patrick Leonard stepped up but bounced into a fielders' choice at second base, ending the scoring threat. In the bottom of the eighth, Kelly worked an 11 pitch at bat against Shuckers RHP Devin Williams (L, 2-1) that ended in a walk. Two batters later, Tristan Gray launched a home run over the right field wall, his second of the season, to put the Biscuits in front for good. Biloxi put two runners on base with two out in the ninth, but Sanders recorded a strikeout to secure the victory for the Biscuits. In total, the Shuckers left a season-high 16 runners on base. The Shuckers now return to Biloxi for a ten-game homestand, starting with a five-game series against the Pensacola Blue Wahoos. On Barks & Brews Monday, fans can enjoy $3 craft beer refills at the Buena Vista Beer Garden with the purchase a Monday mug. Fans can also bring their dog to the game when they purchase a $7 berm ticket. In the series opener, the Shuckers will send RHP Marcos Diplan (0-0, 8.44) to the mound against Blue Wahoos RHP Jorge Alcala (2-0, 1.80). The game can be heard locally on Cruisin' WGCM AM 1240/100.9 FM, TuneIn Radio or the MiLB First Pitch App. The game can also be seen on MiLB.TV and fans can use the promo code 'Shuckers' to save $10. Full Season Shuck Nation memberships, Weekender Shuck Nation memberships and Group Outings for the 2019 Biloxi Shuckers season are on sale now and are available for purchase by calling 228-233-3465, online at biloxishuckers.com or by visiting the MGM Park front office. Biloxi will host the 2019 Southern League All-Star Festivities, with a Home Run Derby on Monday, June 17 and the All-Star Game at 6:35 pm on Tuesday, June 18 at MGM Park. Tickets for 2019 All-Star Events are on sale now.